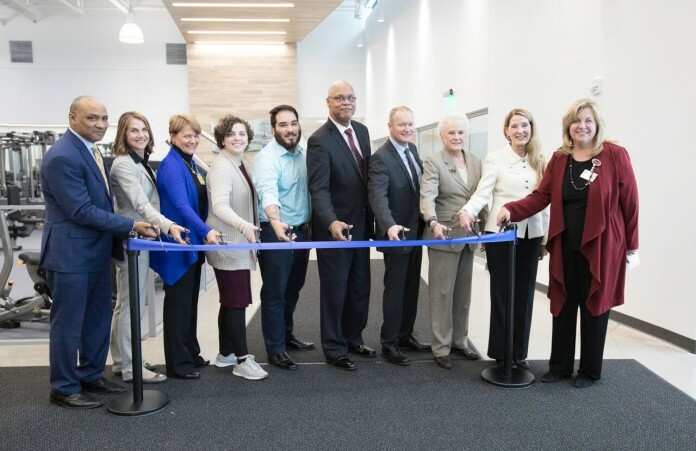 MUSKEGON — Ten years after an idea was first shared, leaders from Muskegon Community College, Grand Valley State University and Mercy Health held a ribbon cutting ceremony November 27 at the new MCC Health and Wellness Center. The 52,000-square-foot facility on MCC’s campus on Quarterline Road will house a health simulation lab, classrooms, a fitness center and gymnasium and a nurse-managed primary care center. The Mercy Health Partners Primary Care Center is a collaboration among MCC, GVSU’s Kirkhof College of Nursing (KCON) and Mercy Health. The suite contains eight exam rooms, a treatment room and a lab, and will provide Grand Valley nursing students and MCC’s nursing, medical assistant and respiratory therapy students with opportunities for clinical experiences. Cynthia McCurren, dean of KCON, said the three institutions began imagining a nurse-managed primary care center 10 years ago. “When academia and health care practice collaborate on an endeavor, students will flourish and partnerships will grow into deep commitments,” McCurren said. The center will open to the public in January and offer primary care services to MCC students, faculty and staff members, and the public. Dr. Kristen Brown, vice president for Mercy Health Physician Partners, said the center will serve a need on Muskegon’s east side.